The XRAY off-road racing cars have received honours and accolades all around the world, including multiple ‘Car of the Year’ awards from RC car magazines around the world as voted on by consumers, and countless victories at all levels of racing, including multiple National and European Championship titles. Over the decade the XRAY off-road cars set a new rise for premium quality and unbeatable reliability and have gained the hearts of racers around the world. The XB4 brings over the same characteristics from the large 1/8 off-road cars. The invention of the XRAY Multi-Flex Technology™ has resulted in some of the most significant milestones in RC model car development in the last decade. This innovation, has not only resulted in awards and accolades, but has proven to be a distinct competitive advantage at tracks worldwide, helping XRAY cars dominate races at the local and national levels. The XB4 is the world’s first 1/10 off-road chassis incorporating the Multi-Flex™ adjustment technology, which allows tuning the chassis flex for different track conditions. It doesn’t matter if the track is low traction, medium or super high traction, you can adjust the chassis flex to suit the track conditions in a matter of seconds, and again adjust the flex easily when the conditions change. It has never been so easy to professionally set-up the flex. It is yet another smart innovation from XRAY. Use soft setting for low-traction, dusty tracks. The car will create a lot of traction with this setting but will have less steering and response compared to stiffer setting. Use medium setting for medium-traction tracks. This setting offers good balance between steering responsiveness and traction. Use stiff setting for high-traction tracks where a lot of steering and car response is required. The more screws used, stiffer the car is and less screws used, softer the car is. Do not remove any other screw except those shown. Provides the car with stability and stiffness, while allowing torsional flex along the lengthwise axis. Absorbs vibrations and works as the main Multi-Flex™ element, allowing the changing of flex independently in the front and rear of the car. CNC-machined from high-quality Swiss 2mm 7075 T6 aluminum, the backbone is strategically machined in low-stress areas to make it as light as possible without affecting strength or rigidity. The strong aluminum backbone protects the bottom of the car from extreme conditions and abusive jumps. The aluminum backbone is perfectly fitted to the composite chassis frame and all holes are perfectly countersunk to provide a smooth surface. The precision engineered and designed composite chassis frame not only enables quick and easy Multi-Flex™ settings, but also houses the main components of the car. The front, center and rear drivetrain bulkheads are keyed into this frame, while it also provides locations for all of the required electronics. The chassis tray design features reinforcement braces in both lengthwise as well lateral directions. The tray design ensures perfect protection from bottom and sides without requiring additional components. the final design was chosen. The motor mount is oriented in the front on the right side, with servo, ESC and receiver placed on the opposite side for balance. To maximize balance both L/R and F/R, a saddle pack battery configuration was used, with the batteries placed to the rear between the spur gear and the suspension mounts. All the electronics can be comfortably placed within the composite chassis frame. The servo mount is held to the chassis using 2 screws for easy and fast exchange. There is plenty of space behind the servo for the ESC and receiver placement. Space has been reserved in front of the motor to allow for an additional cooling fan. The wires between the motor and electronics are routed via a channel in the center of chassis which ensures that they will not interfere with the drive shafts or any other rotating parts. The chassis also features clips for the routing of battery wires. The motor mount is another smart and innovative solution from XRAY. The motor is connected to an eccentric mounting plate, with the assembly then inserted into an integrated motor holder/drivetrain support. The design of this system allows quick and easy motor rotation to adjust gear mesh, and yet clamp securely using only a single screw. To ensure that the motor will not come loose in a serious crash or if the motor mount is not tightened sufficiently, the motor plate has a bayonet mounting system which prevents it from being dislodged from the motor holder. By rotating the motor mount plate to the opposite direction, the motor can be quickly removed from the motor holder. Removing the motor or adjusting the gear mesh has never been more comfortable or faster with changes possible in just a few seconds. Hardened with a proprietary hardening process, the drive shafts provide unbeatable lifetime and reliability. The CVD assembly also feature a composite safety collar which ensures that the mounting pin will never fall out. XRAY’s genuine attention to the smallest details, R&D and engineering are obvious in the design of the diff bulkheads. Unique bulkheads allow super fast and ultra comfortable diff exchange and servicing by dismounting only 4 screws from the front of the bulkhead and from the bottom of the chassis. This super fast diff access is available both in the front and rear. To reduce rotating weight, the super-lightweight diff outdrives are machined from HUDY Spring Steel™ material which allows us to additionally remove material on the outer part of the outdrives, further reducing the weight without effecting durability. The inner part of the outdrives are additionally hand-ground for maximum perfection and fitment into the diff case. The outdrives are hardened using XRAY’s own special hardening process to provide extended life time and reliability. The power from the motor is transferred to the drive train via an adjustable central adjustable slipper clutch for quick and easy tuning. The clutch outdrives are super lightweight and manufactured from HUDY Spring Steel™ and are additionally hardened for extra life and reliability. The slipper plates are machined from premium Swiss 7075 T6 and additionally hardened and with a black final surface treatment. Precision-molded spur gears are made from XRAY's exclusive secret blend of composite material, allowing the gear to run yet be robust enough to handle high performance brushless motors. The spur gears are designed to have the lowest possible weight while staying strong and light. Each gear is stamped with the tooth number for easy identification. The XB4 comes equipped with 81T spur gear which suits majority of tracks. For additional tuning an optional 84T spur gear is available. The correct suspension geometry is one of the most important features of any RC model car yet at the same time is also one of the most difficult and challenging features for a designer. From the suspension arms, through the suspension blocks, to the light, yet robust steering blocks, every suspension part has been specially designed for 1/10 off-road racing platform to provide responsive racing characteristics in all racing conditions. Over the years XRAY has successfully gained and utilized extensive knowledge of suspension geometry and stiffness, which has been applied while designing the suspension parts. The ultra-lightweight suspension parts are molded from a special composite material that makes the parts very light yet very durable to withstand the rigors of high-performance racing. 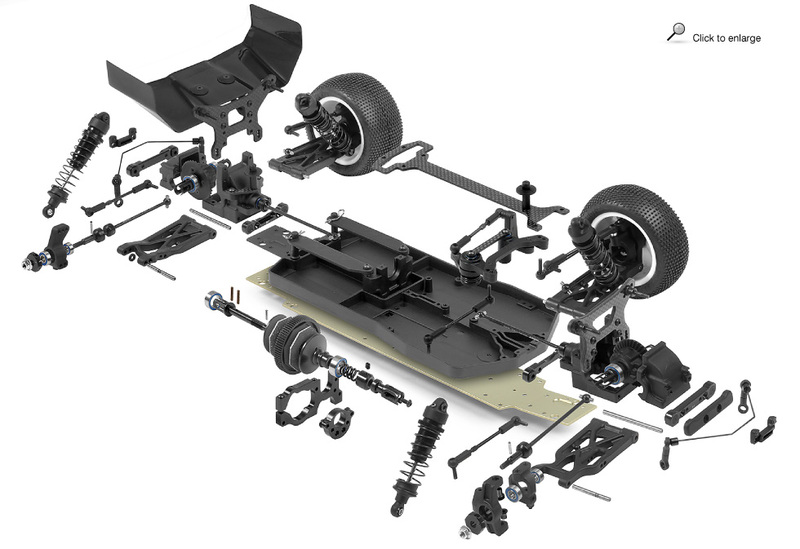 The XB4 platform features suspension parts inspired by the big brother XB9, yet re-engineered for the smaller 1/10 platform. The front and rear arms feature double shock mounting positions and integrated anti-roll bar mount. The aluminum suspension holders feature Integrated Suspension Settings (I.S.S.) which allows for super fast, easy and comfortable suspension geometry setting. This XRAY concept was first introduced in the very first XB8 and now has been carried over to the 1/10 scale XB4. A complete set of various eccentric bushings is included for complete suspension geometry adjustment. The bushings are inserted into aluminum holders which are machined from premium Swiss 7075 T6. Suspension arms are one of the most important parts of any RC model car, as they directly influence the handling and racing characteristics of the car. The XB4 suspension arms are the result of long-term tests of different designs and layouts. Length, thickness, flexibility, geometry of suspension points and materials used… these are all the concepts and details that had to be thoroughly reviewed to create the optimum suspension arms. The 1-piece caster blocks are very lightweight yet the construction of the caster blocks makes them very stiff and rigid. The non-adjustable caster angle is preset for 9°. The roll center position can be easily and quickly adjusted by inserting different thickness of shims on the top of the caster block between the block and the vertical ball stud. The front of the chassis is pre-angled with an integrated kick-up that influences caster angle, however, the position of the adjustable eccentric bushings in the I.S.S. suspension holders influence the caster as well. Therefore, if the eccentric bushings have roll center in middle position the caster angle is 9° and with the 9° in caster block the overall caster angle is 18° caster. The total adjustable caster range in the kit is 16°~20°. for further suspension geometry adjustment. Composite steering block inserts allow for very fast and comfortable lower roll center adjustment. With additional shims and extra inserts a fine tuning of roll center can be easily achieved. For maximum drive train reliability larger 5x12 ball-bearings are used in the outer position with increased dynamic load. On the inner position the smaller 5x10 ball-bearings are used to minimize unsprung weight. When the longer bushing is used at the top, the roll-center is in lower position. Recommended for rough track to gain stability. When the longer bushing is used at the bottom, the roll center is in higher position. Recommended for smooth track to gain more steering. The very compact rear uprights are small in size but thanks to the special composite mixture used also very strong. The lower roll center adjustment has 2 different positions on the upright and the upper roll center adjustment has 3 different positions. The rear uprights feature 0° toe to ensure stability and prevent suspension geometry changes in hard crashes. The outer suspension pin on which the rear upright sits features shims which allow for additional wheelbase adjustment. Ultra-lightweight 14mm wheel hex drive hubs are CNC-machined from Swiss 7075 T6 black-coated aluminum. These ultra-true hex hubs have clamping design which ensures ultra solid mounting of the wheel on the hub. To adjust the track width optional offsets are available -0.75mm and +0.75mm. The dual arm steering system is very simple yet effective and features an integrated easily adjustable servo saver. Ackermann is easily adjusted by quickly and easily changing steering link mounting positions on the steering plate. To guarantee maximum reliability all turnbuckles are manufactured from special HUDY Spring Steel™ material for turnbuckles with a tougher core. These turnbuckles are used for front and rear upright linkages, steering system as well as for the servo saver. Beefy 6mm thick body posts are made from special composite material that provides maximum strength. The body supports are rounded to have a better fit and provide better support to the car body. The top deck is machined from high grade 2.0mm graphite and its main design purpose is not only to hold the body mount but also reinforces the chassis assembly by connecting the front diff bulkhead with the central drive system. The top deck captures the central drivetrain bearings and holds them in place in their supporting bulkheads. To change the batteries is easy and fast. The composite battery straps hold a saddle pack in the chassis and using two clips the battery pack can be easily removed. Machined from premium-grade 3.0mm graphite, the shock towers are lightweight and strong. Front and rear shock towers include multiple shock positions as well multiple roll center adjustment positions. The rear shock tower also holds the wing mount. Well built and reliable shock absorbers are extremely important for super smooth suspension on every type of track. The shocks on the XB4 have been specifically designed to build easily, perform consistently, and last reliably. Attention was paid to even the smallest details during the design process, as well as during the long term testing in various conditions and track types. downstop is adjusted using composite shims under the pistons. Swiss 7075 T6 for maximum strength and hard black coated. The pistons are made from Delrin and are molded using super precise moulds. There are several types of pistons included with different holes and diameters for precise shock adjustments. For custom adjustment even a set of blank pistons are also included. The shock rods are machined from special steel material, precision hand-ground for maximum smooth operation and additionally hardened for increased lifetime. The XB4 springs have been specifically designed to complement the big bore shocks. The spring rate is constant during the entire spring compression. There are springs with different spring rates available as optional tuning parts. The main advantage and benefit of progressive springs is that as the car initially enters the corner they work like a softer spring to provide maximum traction. At the same time, when the chassis begins to roll, in the middle of the corner, the spring rate progressively increases until it works like a stiffer spring which allows the car to maintain maximum cornering speed. very exacting setups and handling of the car. Anti-roll bars are manufactured from special spring steel material and are included to stabilize the car at both front and rear. The roll bars are easily mounted to the diff cases and can be adjusted through the adjustable linkages. Both front and rear anti-roll bars are interchangeable as they have same design and shape. The thickness of each anti-roll bar is laser engraved for easy identification. Anti-roll bar wires of different thickness are optionally available for fine-tuning. Stylish and effective rear wing was designed to work perfectly with the original XRAY XB4 body. Made from strong Lexan material the wing is mounted to the wing mounts supported by extra flat shims to better support and extend the life of the wing. from high quality premium Lexan material. Specially designed XB4 wheels are included in the kit and they do not only perfectly fit but they are also perfect for high competition racing. The wheels are made from very flexible material but are still durable against impacts.